BallastCompatibleAvailable in 4FT. 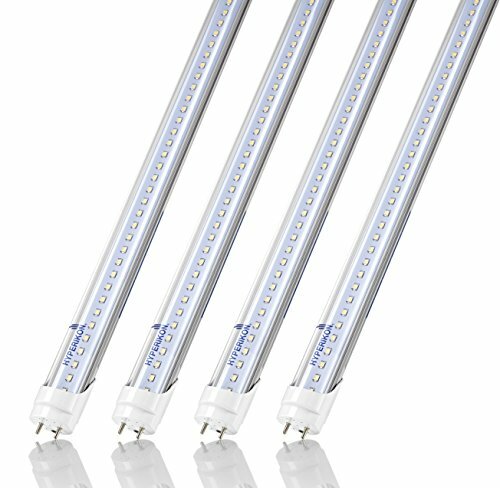 All other T8 LEDs in 2FT, 4FT and 8FT. ✔ 45,000 HOURS - Hyperikon LED tubes have an outstanding life rating of 45,000+ hours and are composed of shatterproof, durable epoxy resin and aluminum alloy. These tubes can last 20+ years depending on use, vastly reducing relamp frequency and maintenance costs. ✔ 130 LUMENS PER WATT - This high output 4ft tube has a lumen count of 2,340 and a CRI rating of 83+. With super bright, high output LED tubes in your garage, warehouse, or office, you will see things in a new light. ✔ 5 YEAR WARRANTY - Hyperikon's hassle-free UNLIMITED 5 Year Warranty is unrivaled in the commercial lighting industry and covers all of our T8 LED tubes no matter what. Contact our customer service team 24/7!